OTTAWA -- Canada has offered to accept dozens of White Helmets and their families from Syria following a dramatic rescue over the weekend that was orchestrated by the Israeli military and personally encouraged by Prime Minister Justin Trudeau. Named for their easily recognizable head gear, the all-volunteer White Helmets have been lauded and supported by Canada and other Western nations for their role as first responders and humanitarian workers who have saved hundreds of lives during Syria's brutal civil war. But with the Syrian government having regained control of much of the country, and moving to wrest back the last of several rebel-held areas in recent weeks, there had been concerns that dozens of White Helmets stranded on the border with Jordan would become targets for Syrian troops. Israeli Prime Minister Benjamin Netanyahu revealed Sunday that Trudeau and U.S. President Donald Trump were among those who asked Israel to rescue the White Helmets in recent days, after leaders first talked about helping the White Helmets during the recent NATO summit in Brussels. "Several days ago, U.S. President Trump contacted me, as did Canadian Prime Minister Trudeau and others, and requested that we assist in evacuating hundreds of White Helmets from Syria," Netanyahu said in Hebrew during an online address. "These are people who have saved lives and whose lives were in danger. Therefore I approved their passage through Israel to additional countries as an important humanitarian gesture." Exactly when the White Helmets will arrive is unclear; the rescued Syrians are expected to remain in a UN refugee camp for at least three months to allow for processing. Canada has been among several countries that have provided moral and financial support to the White Helmets, which are officially known as Syria Civil Defence, including $7.5 million over the past two years to help recruit and train women. "The White Helmets are courageous volunteers and first responders who risk their lives to help their fellow Syrians who have been targeted by senseless violence," Foreign Affairs Minister Chrystia Freeland said in a statement on Saturday. 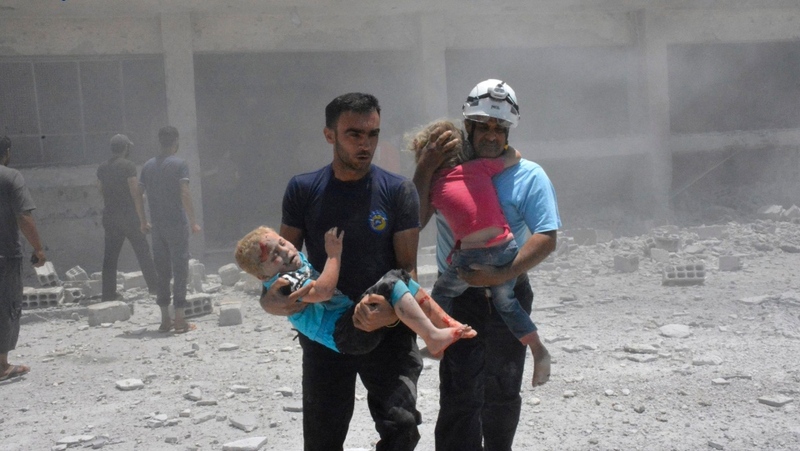 "When children, women, and men in Syria flee for their lives, the White Helmets run towards danger, towards the rubble, to save the innocent and the wounded. The White Helmets have witnessed vicious atrocities committed by the Assad regime and its backers." But the Syrian government and its Russian backers have denounced the group as little more than a tool for Western propaganda, and accused its members of being in league with Islamist insurgents. The group, which counts about 3,000 members, insists that it is neutral. Its ranks are made up of people from all walks of life include bakers, pharmacists, and teachers. Dozens have been killed in the line of duty, including seven that were gunned down at the group's office in the Idlib province in 2017. The group was nominated for the Nobel Peace Prize in 2016 for its humanitarian efforts. In 2017, a Netflix documentary about the group, "The White Helmets," won the Oscar for best documentary short. Another documentary, "Last Men in Aleppo," was nominated the following year for best documentary feature. The Syrian civil war has raged since 2011, leaving 350,000 people dead and millions more displaced.